Until now, Earth was the only planet known to have vast reservoirs of water in its interior. Scientists analyzed the water content of two Martian meteorites originating from inside the Red Planet. They found that the amount of water in places of the Martian mantle is vastly larger than previous estimates and is similar to that of Earth’s. The results not only affect what we know about the geologic history of Mars, but also have implications for how water got to the Martian surface. 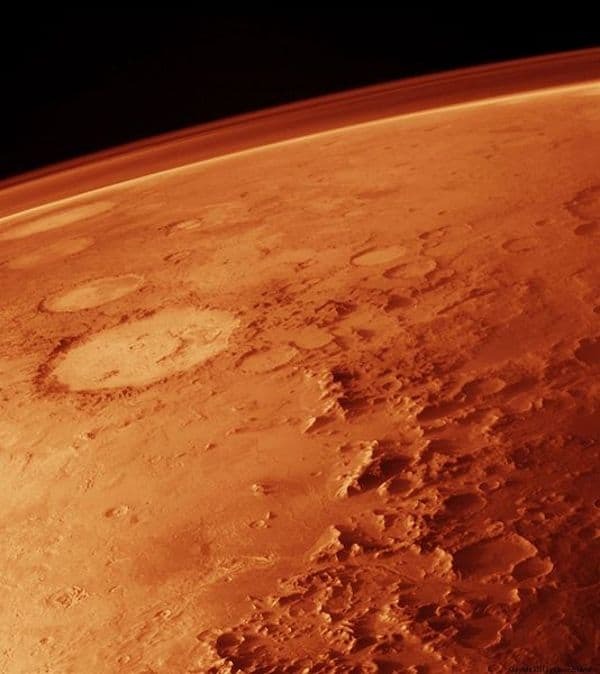 The data raise the possibility that Mars could have sustained life. The research was led by former Carnegie postdoctoral scientist Francis McCubbin, now at the University of New Mexico. The analysis was performed by Carnegie Institution investigator Erik Hauri and team and is published in the journal Geology. The scientists analyzed what are called shergottite meteorites. These are fairly young meteorites that originated by partial melting of the Martian mantle—the layer under the crust—and crystallized in the shallow subsurface and on the surface. They came to Earth when ejected from Mars approximately 2.5 million years ago. Meteorite geochemistry tells scientists a lot about the geological processes the planet underwent. Based on the mineral’s water content, the scientists estimated that the Martian mantle source from which the rocks were derived contained between 70 and 300 parts per million (ppm) water. For comparison, the upper mantle on Earth contains approximately 50-300 ppm water. Hauri and team were able to determine these values with new techniques and new standards they developed that can quantify water in apatite using a technology called secondary ion mass spectrometry (SIMS). Pretty interesting discovery! You never know what your going to find once you start scratching the surface. Check out my opinionated blog on mars if you want! I am very educated scientist, is inaccurate. Do not fear, all is good. Yep,…… we are all dead.